İstanbul’un içme suyu ihtiyacının önemli bir kısmını karşılayan Darlık Baraj Gölü’ne akan derelerin zooplankton faunasını belirlemek amacıyla, Ekim 2008-Eylül 2010 tarihleri arasında, seçilen 5 istasyonda aylık periyotlar şeklinde örnekleme yapılmıştır. Çalışma alanının zoo-plankton kommunitesi başlıca Rotifer, Kopepod ve Kladoser gruplarından oluşmuştur. Çalışma süresince 25’i Rotifer, 7’si Kopepod ve 7’si Kladoser’e ait olmak üzere toplam 39 taxa tanımlanmıştır. Toplam zooplanktonun % 47.8’ini Rotifer, % 43.9’unu Kopepoda ve % 8.3’ünü Kladoser oluşturmuştur. Shannon-Wiener çeşitlilik indeksi istasyonlar için 2.4-3.1; mevsimsel olarak 1.1-3.4 arasında tespit edilmiştir. Genel olarak yüksek değerler, zooplankton bolluğu ve sıcaklığın artış gösterdiği durumlarda tespit edilmiştir. Çalışmada ayrıca çözünmüş oksijen, elektriksel iletkenlik, pH ve su sıcaklığı parametreleri de belirlenmiş ve sonuçlar tespit edilen zooplankton türlerinin tercih ettikleri yaşam alanları için uygun aralıklarda belir-lenmiştir. Tanımlanan tüm zooplankton türleri çalışma alanı için ilk kayıt niteliğindedir. Water is the most important element for hu-man life and is a limited resource contrary to popular belief. Zooplankton are an important link in the transformation of energy from producers to consumers (Sharma et al., 2010). Zooplankton plays a key role as efficient filter feeders on the phytoplankton and as a food source for other in-vertebrates, fish larvae and fish (Deksne et al., 2011). Zooplanktonic organisms are bioindicators of water quality and pollution degree because they are strongly influenced by environmental changes and responds quickly to alternations in locality quality (Gannon and Stemberger, 1978). Biodiversity has been described as the primary criterion ensures the continuity of the human race by ecologists. In aquatic ecosystems, declining of zooplankton diversity, which is second level of the food webs will affect superior trophic levels and as long as this situation continues, it causes species, habitat or even ecosystems loss, eventu-ally leading negative consequences for human beings. They are also a second important step of food chain, for changing the herbal products to animal protein. Zooplanktonic organisms creates food resources for fish, fish larvae and invertebrates in aquatic systems, therefore they provide a flow of energy through the food chain. Although many studies have been conducted about zooplankton in Turkish lentic waters, relatively few studies were conducted in lotic waters. By these re-searches, the rotifer fauna of Gümüldür Stream (Ustaoğlu et al., 1996), the rotifer and cladoceran fauna of Seyhan Stream (Göksu et al., 1997), the cladoceran and copepod fauna of Gümüldür Stream (Ustaoğlu et al.,1997), the zooplankton of the Streams of west Aegean Region (Balık et al., 1999), the zooplankton of Gediz River Delta (Ustaoğlu et al., 1999), the rotifer fauna and its seasonal variations of Fırat River (Saler et al., 2000), the rotifer fauna and its seasonal varia-tions of Zıkkım Stream (Saler and Şen, 2001), the rotifer fauna of Asi River (Bozkurt et al., 2002), the zooplankton fauna of some rivers in Mediter-ranean Region (Ceyhan Nehri, Seyhan Nehri, Manavgat Nehri, Savrun Suyu, Keşiş Çayı) (Bozkurt, 2004), the Copepoda and Cladocera fauna of Asi River (Göksu et al., 2005), the Ro-tifera fauna of Euphrates River basin (Akbulut and Yıldız, 2005), Rotifer fauna of Seli Stream (İpek and Saler, 2008), the zooplankton fauna of Kars River (Özbay and Altındağ, 2009), zoo-plankton structure of Karaman Stream (Altındağ et al., 2009), zooplankton succession of the Asi River (Bozkurt and Güven, 2010) and Rotifera fauna of Zamantı River and Homurlu Stream (Kaya et al., 2010), the zooplankton fauna of Kürk Stream (Saler et al.,2011), the zooplankton fauna of Porsuk Stream (Kırkağaç et al.,2011), the zooplankton fauna of Yuvarlak Stream (Mis et al., 2011), the zooplankton fauna of Munzur River (Saler, 2011) and the zooplankton fauna of Görgüşan and Geban Stream (İpek and Saler, 2012) were determined. Darlık Reservoir is an important source for the metropole because it suppliesmajor portion of the daily drinking water needs of Istanbul. There-fore, the aim of this paper was to determine the zooplankton fauna of the study area, where no previous relevant data were available. The study was conducted on Darlık Stream and its tributaries Hepçe and Değirmençayırı, which are the main sources of Darlık Reservoir. Darlık Reservoir was established on Darlık stream between 1986-1988, and it is one of the most important drinking water resources of İs-tanbul. Samples were collected at selected 5 sta-tions on the streams. St.1, St.2 and St.5 were se-lected on the Darlık Stream from the mouth to the inner part of the stream. St.3 and St.4 were se-lected on the tributaries of Darlık Stream. St.1 is the nearest station to the reservoir and its deep structure is stony. It is surrounded by agricultural areas. Deep structure of the St.2 is muddy, sandy and stony. Submerged vegetation spreads largely in summer months. St.3 (Hepçe) is a small stream, which pass near Çengili Village. It has a stony and rocky deep. Submerged vegetation oc-curs abundantly in summer months. There are cold water resources in and nearby the stream. The stream is surrounded by agricultural and damaged forestry areas. St.4 (Değirmençayırı) is a stream, which pass through Değirmençayırı Village has stony and big rocks on bottom. There are houses, farming areas, animal shelters and one filling station around the stream. The deep structure of St.5 is composed of mostly big rocks and stones. Although there is no residential area around, it has agricultural fields. The sampling stations are shown in Figure 1. This study was carried out between 29 Octo-ber 2008 and 16 September 2010, with monthly intervals. The obtained data were evaluated as seasonally. Five sampling stations were chosen in streams flowing into the Darlık Dam Lake (Fig. 1). Zooplankton was collected in each station by filtering 45 L of water through a plankton net with 55 μm mesh size, preserved with 4% for-maldehyde solution immediately and then identi-fied under a binocular microscope and counted under an inverted microscope. All the zooplank-ton densities are presented as number of individ-uals per liter (ind. L-1) (Czerniawski and Pilecka-Rapacz, 2011). The following references were reviewed to identify the specimens: Dussart (1967, 1969), Koste (1978) and Margaritora (1983). During the sampling period, dissolved oxygen, conductivity, salinity, pH and water temperature were measured in situ using portable instruments (WTW 310i multiparameter). where H' is the Shannon-Wiener diversity index, S is the number of species, pi is the relative abundance of each species (pi= fi/n), fi is the abundance of species i and n is the total number of all individuals. In the present study the community structure and diversity of zooplankton and some environ-mental parameters investigated monthly in Darlık Stream and its tributaries Hepçe and Değirmen-çayırı, which are the main sources of Darlık Res-ervoir, during 29 October 2008 and 16 September 2010. The water temperature fluctuated in the range of 5.6 °C in winter and 24.4 ºC in summer (annu-al average of 14.2 °C). DO was measured with an annual average of 8.11 mg L-1(min. 2.7 mg L-1; max. 14.9 mg L-1). The highest DO values were found in winter. pH values are on the alkaline side and varied between 7.1 and 8.8 (average 8.1). EC values ranged from 102.2 to 581.0 μmho cm-1 with an annual average 358.7 μmho cm-1. Chlorophyll a values alternated in the range of 0.11 μg L-1 in winter and 91.02 μg L-1 in autumn (annual average of 1.36 μg L-1). Some physical and chemical parameters of water quality meas-ured over two years (seasonally) study are given in Table 1. According to the Drinking Water Regulation by the Ministry of Forestry and Water Affairs (Anonymous, 2005), study area was found A2 water quality class by the determined parameters. Table 1. Some physical and chemical parameters. In lotic areas, true plankters often predomi-nate and fast growing rotifers are often dominant. This may be a simple trophic effect or it may be that similar conditions favour both types of or-ganism (Hynes 1970). Although water discharge is considered to be one of the main parameters affecting zooplankton seasonal variations in riv-ers (Saunders and Lewis 1988a,b, Brown et al. 1989, Pace et al. 1991, van Dijk and van Zanten 1995, Vranovsky 1995). The zooplankton community of the study area is composed of mainly Rotifera and zooplankton-ic Crustacea (Copepoda and Cladocera). During the study period a total of 39 taxa was observed, with 25 taxa of Rotifera, 7 taxa of Copepoda and 7 taxa of Cladocera identified (Table 2). 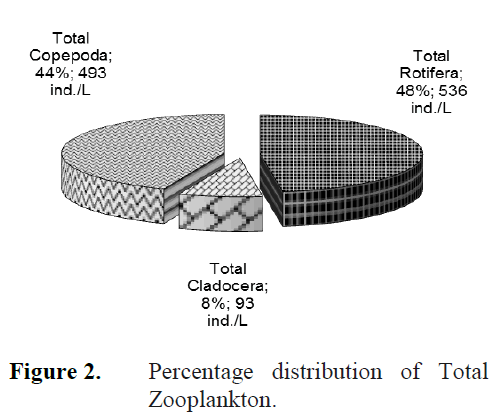 Rotifera comprised 47.8%, Copepoda 43.9% and Cladoc-era 8.3% of the total zooplankton density (Fig. 2). Rotifera was the dominant group in study area. At the sampling stations, the number of zoo-plankton species was as herein defined; 19 taxa at station 1, 19 taxa at station 2, 13 taxa at station 3, 21 taxa at station 4 and 23 taxa at station 5 (Table 3). The number of species at the fifth sta-tion was higher than the other stations and the lowest number of species was at the third station. Most of the species were determined at all the stations throughout two years. However, Colurel-la obtusa and Chydorus gibbus were only found at St.1, Euchlanis incisa, Pleuroxus aduncus and Paracyclops affinis only at St.2, Brachionus calyciflorus, Colurella colurus, Lecane (Mono-styla) lunaris and Lepadella ovalis only at St.4, and Anuraeopsis fissa, Brachionus angularis, Monommata arndti, Platyias quadricornis, Trichocerca pusilla and Trichocerca similis grandis only at St.5 (Table 3). Table 2. Classifications of the zooplankton species living in study area are as follows (Ustaoğlu, 2004). Among the identified species, Keratella coch-learis, Rotaria rotatoria (Pallas, 1766), Alona rectangula, Daphnia longispina, Canthocamptus staphylinus, Diacyclops languidus and Eucyclops macrurus were determined in zooplankton almost always during the sampling period (Table 3.). The dominant Rotifer in the study area was K. cochlearis. As for crustacean zooplankton, Cla-docerans Alona spp. and D. longispina, and the copepod Thermocyclops oithonoides were domi-nant (Table 3.). The lowest number of zooplank-ton were observed in winter and spring. In win-ter, 9 zooplankton taxa were recorded, and the dominant zooplankton taxa were the Rotifer K. cochlearis, the cladoceran Alona guttata and the Copepoda E. macrurus. 9 zooplankton taxa were recorded in spring. The dominant zooplankton taxa were K. cochlearis again, the Cladoceran D. longispina and the harpacticoid copepod C. staphylinus. Seasonally, the highest number of zooplankton were observed in summer and au-tumn (335 ind. L-1 and 526 ind. L-1, respectively). In summer 27 taxa were recorded. Copepoda was the dominant group in summer and autumn (61.5% and 52.47% of total zooplankton, respec-tively). The dominant taxa during summer were E. macrurus and D. languidus of copepoda, and the cladocerans A. guttata and D. longispina, and the rotifer A. fissa. 26 taxa were recorded in au-tumn. The dominant taxa of zooplankton were determined K. cochlearis, T. oithonoides and A. rectangula as Rotifera, Copepoda and Cladocera, respectively. Table 3. Seasonally distribution of zooplankton species in each station in study area. Evaluating all 4 seasons and 5 stations of the study, the dominant taxa were the Rotifers K. cochlearis (28.7%), R. rotatoria (4.46%) and A. fissa (3.48) , the Cladocerans A. guttata (3.74%) and D. longispina (2.50%), and the copepods T. oithonoides (15.06%), D. languidus (10.61%) and E. macrurus (9.98%). Seasonal variation (ind. 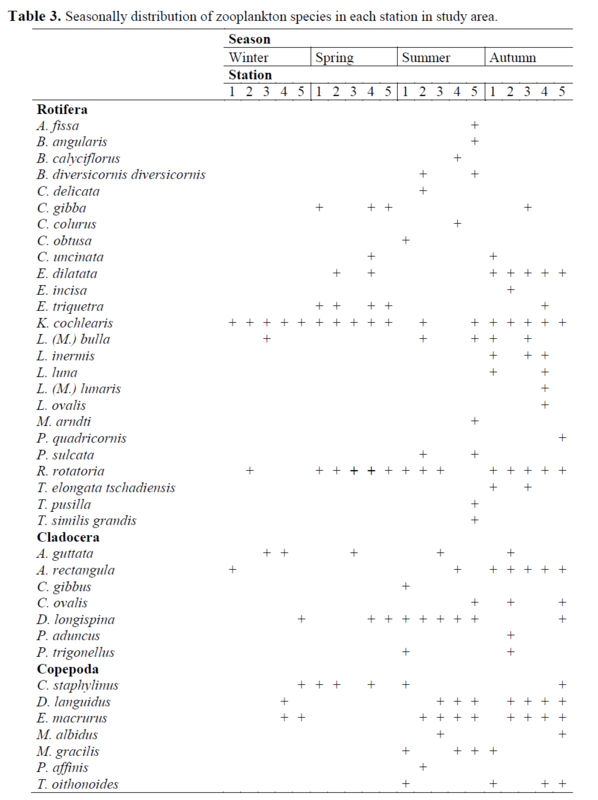 L-1) depending on the stations in the main zooplankton groups (Rotifera, Copepoda and Cladocera) is given in Figure 3 and the seasonal distribution of the zooplankton of the streams is given in Table 3. Figure 2. Percentage distribution of Total Zooplankton. Figure 3. Seasonal distribution of zooplankton groups (Total Rotifera, Total Copepoda, Total Cladocera) and Total Zooplankton number (org. L-1) in study area. Studies conducted on the lotic waters of Tur-key are given in introduction. Common species in other study areas and present study shown in Table 4. In present study, identified species Bra-chionus diversicornis diversicornis, Cephalodella delicata, Euchlanis triquetra, Trichocerca elon-gata tschadiensis, T. similis grandis, Chydorus ovalis, P.affinis and T. oithonoides were not re-ported for zooplankton of Turkish inland waters by Ustaoğlu (2004). Also B.diversicornis diver-sicornis, C. delicata, E.incisa, E. triquetra, Lecane inermis, M. arndti, T. elongata tschadi-ensis, T. pusilla, T. similis grandis, C. gibbus, C. ovalis, D. languidus, E. macrurus, M. gracilis, P. affinis and T. oithonoides were not reported from the other studied lotic areas since 2004 of Turkey (Table 4). Table 4. Common species with other study areas in Turkey. Most of the defined taxa (B. angularis, B. calyciflorus, E. dilatata, K. cochlearis, L. bulla, L. ovalis and A. rectangula) are cosmopolitan, and they were reported that they can be found in aquatic macro-vegetation (Bozkurt ve Güven, 2010). Furthermore, some species belonging to the genera Lecane, Lepadella and Cephalodella are littoral-periphytic forms (Bekleyen, 2001). Member of Lecane, Lepadella, Colurella and Trichocerca genus are able to adapt to various physical and chemical environments (Koste, 1978). Keratella, Brachionus and Trichocerca species are usually reported as dominant zoo-plankton taxa of lotic areas (Altındağ and Özkurt, 1998; Bekleyen, 2001; Altındağ and Yiğit, 2002; Tellioğlu and Şen, 2002; Güher, 2003). Among the identified species, K. cochlearis, Trichocerca spp., Brachionus spp. and A. fissa are well-known indicators of eutrophy (Sladeck, 1983; Kolisko, 1974). However, high abundance of these taxa were determined only some stations, when the water temperature was ascended. Among the identified species of the Cladocera group P.aduncus and D. longispina and of the Rotifera group Euchlanis dilatata, P. quadricor-nis, Lecane luna, Lecane bulla are among the species characteristic of eutrophic waters (Ber-zins and Bertilson, 1989; Apaydın Yağcı and Ustaoğlu, 2012). B. angularis and B. calyciflorus are characteristic species of alkaline waters (Koste, 1978). D. languidus is a littoral species, and do also occur in groundwater. This species was determined dominant copepod in summer at St.3, which is cold water resources in and nearby the stream. E. macrurus is most common in the macrophyte zone, it is acid sensitive and is one of the most common copepods in electrolyte rich environment with pH>7.0. Other dominant cope-pod species in summer was E. macrurus, and it was determined with dense vegetation at the St.3. T. oithonoides increases when surface area in-creases with rain. It has a relatively wide toler-ance to pH (4.7-7.9) and electrolyte rich water to favourite. Therefore it was the dominant cope-poda species in autumn at the St.5. A. guttata is a quite common littoral species. Differences in pH do not seem affect occurence of A. guttata, which has been found in localities with pH ranging from 3.9 to 9.9. frequency of records of A. guttata in-crease with increasing levels of electrolytes in the water. This species was found in summer at St.3, when the pH and EC values were increased. The Shannon–Wiener diversity index of the log-transformed means of zooplankton species density of the study area showed similar values (2.4-3.1) during the study period for all stations (Fig. 4 A,B). Zooplankton diversity index varied between 1.1-3.4, seasonally (Fig. 4 C,D). Gener-ally, the higher values and higher temperature showed a higher zooplankton diversity index (Fig. 4). Changing physicochemical conditions affects the distribution and occurence of zooplankters directly or indirectly. The dynamics of the eco-logical attributes of zooplankton are well known in lakes and reservoirs in Turkey, however, few studies have been conducted in lotic environ-ments. All physical, chemical and biological properties should be considered to understand the factors affecting the distribution of population (Sharma et. al., 2010). No study was previously carried out on the zooplankton fauna of study area, consequently it is not possible to follow the changes of zooplank-ton fauna in these streams. Present study, will be a base for the future studies in these streams and further to the acquirements of Turkey’s biodiver-sity. We thank Cihan GAYGUSUZ, Nurcan GAYGUSUZ and Nadi GÖKALP helping us for sampling, Assoc. Prof. Reyhan AKÇAALAN ALBAY kindly checked the language of the manuscript. Akbulut Emir, N., Yıldız, K., (2005). The rotifera fauna of Euphrates of River Basin (Turkey), Hacettepe Journal Biology and Chemistry, 34: 93-105. Altındağ, A., Özkurt, Ş., (1998). A Study on the zooplanktonic fauna of the Dam Lakes Kunduzlar and Çatören (Kırka-Eskisehir), Turkish Journal of Zoology, 22: 323-331. Altındağ, A., Yiğit, S. (2002). The Zooplankton fauna of Lake Burdur, EgeUniversity Jour-nal of Fisheries and Aquatic Sciences, 19: 129-132. Altındağ, A., Buyurgan, Ö, Kaya, M., Özdemir, E., Dirican, S., (2009). A Survey physico-chemical parameters and zooplankton struc-ture in Karaman Stream, Antalya, Turkey, Journal of Animal and Veterinary Advances, 8(9): 1710-1716. Anonymous, (2005). Drinking water Regulation by the Ministry of Forestry and Water Af-fairs. Issued by Republic of Turkey, Minis-try of Forestry and Water Affairs, Official Gazette no: 25999 (in Turkish). Balık, S., Ustaoğlu, M.R., Sarı, H.M., (1999). 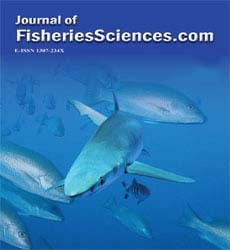 Kuzey Ege Bölgesi’ndeki akarsuların fau-nası üzerine ilk gözlemler, EgeUniversity Journal of Fisheries and Aquatic Sciences, 16(3-4): 289-299. Bekleyen, A., (2001). A Taxonomical study on the rotifera fauna of Devegeçidi Dam Lake (Diyarbakır-Turkey), Turkish Journal of Zo-ology, 25: 251-255. Bozkurt, A., Göksu, M.Z.L., Sarıhan, E., Taşdemir, M., (2002). Asi Nehri Rotifer faunası (Hatay, Türkiye), EgeUniversity Journal of Fisheries and Aquatic Sciences, 19(1-2): 63-67. Bozkurt, A., (2004). Preliminary observation on the Zooplankton fauna of some rivers in Mediterranian Region, Turkish Journal of Aquatic Life, 3: 65-70. Brown, A.V., Limbeck, R.L., Schram, M.D., (1989) Trophic importance of zooplankton in streams with alluvial riffle and pool geo-morphometry, Archiv für Hydrobiologie, 114: 349-367. Czerniawski R., Pilecka-Rapacz M., (2011) Summer zooplankton in small rivers in rela-tion to selected conditions, Central European Journal of Biology, 6(4): 659-674. doi: 10.2478/s11535-011-0024-x. Deksne, R., (2011). Influence of wastewater on zooplankton community of the Daugava River after Daugavpils wastewater treatment plant modernization. Environment. Technol-ogy. Resources Proceedings of the 8th Inter-national Scientific and Practical Conference. Volume 1, Rēzeknes Augstskola, Rēzekne, RA Izdevniecība, ISSN 1691-5402, ISBN 978-9984-44-070-5. Dussart, B., (1967). Les Copépodes Des Eaux Continentales D’Europe Occidentale, Tome I Calanoides et Harpacticoides, Ed: N.Boubée and Cie 3, Place Saint-André-des-Arts, Paris 6º. Dussart, B., (1969). Les Copépodes Des Eaux Continentales D’Europe Occidentale, Tome II Cyclopoides et Biologie, Ed: N.Boubée and Cie 3, Place Saint-André-des-Arts, Paris 6º. Göksu, L., Çevik, F., Bozkurt, A., Sarıhan, E., (1997). Seyhan Nehri’nin (Adana il merkezi sınırları içindeki bölümünde) rotifera ve cla-docera faunası, Turkish Journal of Zoology, 21: 439-443. Göksu, M.Z.L, Bozkurt, A., Taşdemir, M., Sarıhan, E., (2005). Asi Nehri (Hatay, Tü-rkiye) Cladocera ve Copepoda (Crustacea) faunası, Ege University Journal of Fisheries and Aquatic Sciences, 22(1-2):17-19. Güher, H., (2003). Mert, Erikli, Haman ve Pedina Göllerinin (İğneada/Kırklareli) zooplank-tonik organizmalarının kommunite yapısı. EgeUniversity Journal of Fisheries and Aquatic Sciences, 20(1-2): 51-62. Hynes, H. B. N., (1970). The Ecology of Run-ning Waters. Liverpool University Press. 555 pp. İpek, N., Saler, S., (2008). Seli Çayı (Elazığ, Tü-rkiye) Rotifer faunası ve bazı biyoçeşitlilik indeksleri ile analizi, Ege University Journal of Fisheries and Aquatic Sciences, 25(3): 211-215. Kaya, M., Altındağ, A., (2007). Zooplankton fauna and seasonal changes of Gelingüllü Dam Lake (Yozgat, Turkey), Turkish Jour-nal of Zoology, 31: 347-351. Kırkağaç, M.U., Demir, N., Topçu, A., Fakıoğlu, Ö., Zencir, Ö., (2011). An Investigation on aquatic macrophytes, zooplankton and ben-thic macroinvertebrates in Porsuk River (Eskişehir), Ankara Üniversitesi Çevrebilim-leri Dergisi, 3(1): 65-72. Kolisko, R.A., (1974). Plankton Rotifers Biology and Taxonomy. Biological Station Lunz of the Austrian Academy of Science, Stuttgart. Koste, W., (1978). Rotatoria. Die Rädertiere Mit-teleuropas. Ein Bestimmungswerk, Begrün-det von Max, Voigt Überordnung Monogo-nonta, Gebraider Borntraeger Berlin Stutt-gart. Margaritora, F., (1983). Cladoceri (Crustacea: Cladocera), Guide Per IL Riconoscimento Delle Specie Animali Delle Acque Interne Italiane 22. Consiglio Nazionale Delle Ri-cerche AQ/1/197, Verona, Italy. Özbay H., Altındag, A., (2009). Zooplankton abundance in the River Kars, Northeast Tur-key: Impact of environmental variables, Af-rican Journal of Biotechnology, 8(21): 5814-5818. Saler, S.E., Şen, B., Şen, D., (2000). Fırat Nehri’nin Kömürhan Bölgesi Rotiferleri (Rotatoria; Aschelmintes) ve mevsimsel değişimleri. Su Ürünleri Sempozyumu, 20-22 Eylül, 385-396, Sinop. Saler, S.E., Şen, B., (2001). Hazar Gölü’ne Dö-külen Zıkkım Deresi’nin (Elazığ) Rotiferleri ve Mevsimsel Değişimleri. XI. Ulusal Su Ürünleri Sempozyumu, 04-06 Eylül, 261-271, Hatay. Saunders, J.F., Lewis, W.M. (1988b). Zooplank-ton abundance and transport in a tropical white-water river, Hydrobiologia, 162: 147-155. Shannon, C.E., Weaver, W., (1949). The Mathe-matical theory of communication. The Uni-versity of Illinois Press, Urbana, IL. Sharma, S., Siddique, A., Singh, K., Chouhan, M., Vyas, A., Solnki, C.M., Sharma, D., Nair, S., Sengupta, T., (2010). Population dynamics and seasonal abundance of zoo-plankton community in Narmada River (In-dia), Researcher, 2(9): 1-9. Tellioğlu, A., Şen, D., (2002). Hazar Gölü (Elazığ) rotifer faunasının taksonomik yönden incelenmesi, Ege University Journal of Fisheries and Aquatic Sciences, 19: 205-207. Ustaoğlu, M.R., Balık, S., Aygen, C., Özdemir, D. (1996). Gümüldür Deresi’nin (İzmir) Ro-tifer faunası, Ege University Journal of Fisheries and Aquatic Sciences, 13(1-2): 163-169. Ustaoğlu, M.R., Balık, S., Özdemir, D., Aygen, C., (1997). Gümüldür Deresi’nin (İzmir) Cladocera ve Copepoda Faunası, IX. Ulusal Su Ürünleri Sempozyumu, 17-19 Eylül, 291-299, Eğirdir, Isparta. Ustaoğlu, M.R., Özdemir Mis, D., Aygen, C., (1999). İçsu Zooplanktonu. In: Sulak alan-ların yönetimi projesi, Gediz Deltası sulak alan yönetim planı alt projesi. Final raporu, Çevre Bakanlığı, Çevre Koruma Genel Müdürlüğü, Proje No: 97K100020, Ankara: 263-274. Ustaoğlu, M.R., (2004). A Check-list for zoo-plankton of Turkish inland waters, EgeUni-versity Journal of Fisheries and Aquatic Sciences, 21(3-4): 191– 199. Vranovsky, M., (1995). The effect of current ve-locity upon the biomass of zooplankton in the river Danube side arms, Biologia Brati-slava, 50: 461-464.